PSG captain Thiago Silva's header went in off Radamel Falcao — Monaco's top scorer — for PSG's sixth goal before Germany winger Julian Draxler netted the seventh. Monaco later tweeted that it will reimburse fans who traveled to the game for the cost of their tickets. Monaco thrilled Europe last season with a scintillating brand of attacking soccer producing more than 150 goals and taking the side to the Champions League semifinals. It made a fortune selling its best players — including teen star Kylian Mbappe to PSG for 180 million euros (then $216 million) but appears to have paid the price on the field. Now Monaco faces a scrap to hold onto second place and an automatic Champions League berth, with Lyon and Marseille just four points behind. 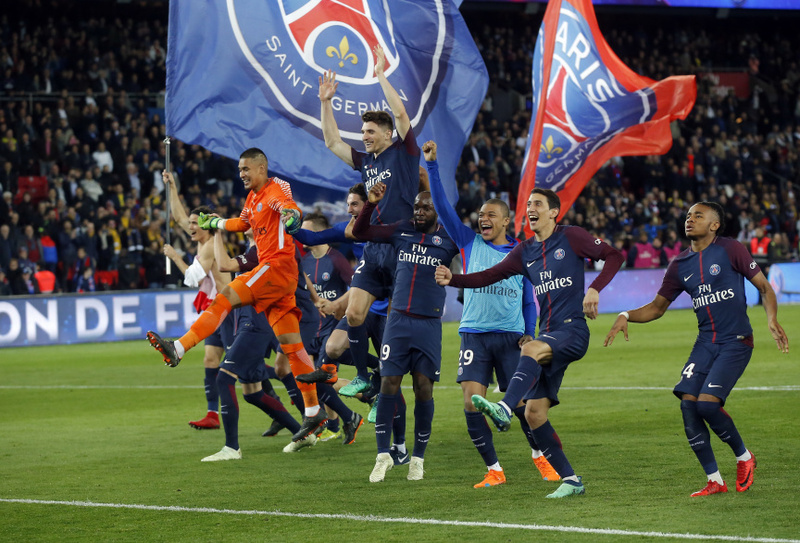 Lo Celso finished off a fine team move in the 14th minute, and Cavani headed powerfully home three minutes later at a jubilant Parc des Princes. Cavani then turned provider, picking out Di Maria with a brilliant pass from the halfway line and he sprinted through before beating goalkeeper Danijel Subasic with a superb chip. Lo Celso started and finished the move for the fourth, rising to meet Javier Pastore's first-time cross from the left with a thumping header. Midfielder Rony Lopes pulled one back for Monaco in the 38th. PSG completely relaxed and Pastore almost set up another goal — albeit for Lopes — with a careless pass back across his own penalty area. But goalkeeper Alphonse Areola saved his shot. Pastore then set up Di Maria for a slick finish and 5-1 after 58 minutes. Moments later, Di Maria hit the post. After Silva's header clipped Falcao's shoulder and went in, Draxler's shot from the edge of the penalty took a slight deflection before going in. Mbappe won a second straight title by the age of 19, and television cameras showed him laughing on the bench near the end. Earlier, Marseille secured a last-gasp 3-2 win at Troyes to move level on points with Lyon, which is in third place on goal difference. Dimitri Payet set up the equalizer before Florian Thauvin grabbed the late winner against a spirited Troyes side. Marseille, which reached the Europa League semifinals on Thursday thanks to a masterful midfield display from Payet, made an awful start. Striker Samuel Grandsir put Troyes ahead in the first minute and, after forward Clinton N'Jie equalized in the 11th, 19th-place Troyes regained the lead through 41-year-old midfielder Benjamin Nivet. Then Payet set up Greece striker Kostas Mitroglou in the 75th and the irrepressible Thauvin volleyed home left back Jordan Amavi's cross in the 86th for his 17th league goal. Bordeaux took advantage of some usually sloppy defending to win 3-1 at Montpellier. Montpellier has the second-best defense in the league but fell behind to Denmark forward Martin Braithwaite's ninth-minute goal. Forward Francois Kamano and midfielder Soualiho Meite netted after the break, before Ellyes Skhiri got a late consolation.